Comment: G-11 is the main Garlaige Citadel entrance; the J-10 exit is a one-way from Garlaige Citadel. 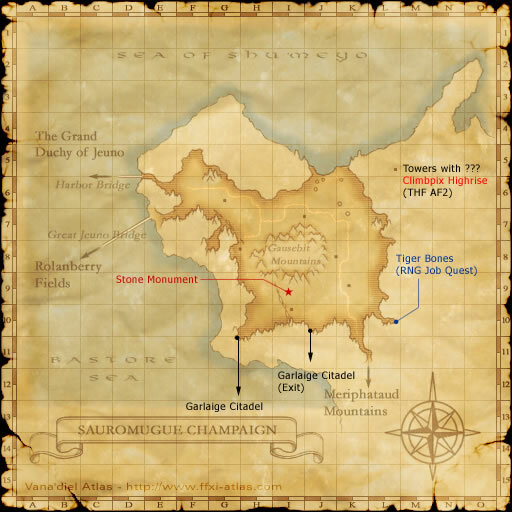 Sauromugue Champaign (S) =Update=<br /> Hey guys, this site is really helpful, but they havent updated it yet, theres no Sauromugue Champaign (S) page. So if i Save just one person the hassle, WATCH OUT FOR GNATS! They are small, but hit hard and fast, and they aggro, high lv maybe around 70s. a party of 6 can easily do it, minus the Amnesia, I'd compare the difficulty to an Heradic Imp in Caederva Mire.